We are still alive! And still playing hammerball. Greetings to the polo-verse, Ann Arbor Polo is still alive and well. I apologize for the year+ lack of posting. I had a sledge hammer of a school year and a busy summer in the shop to keep me from updating this blog. But now I’ve got some free time to update and write a post. Also our club mate ‘lil Jim should be starting to contribute to this blog in hopes of breathing fresh life into it. I should take polo blogging to the next level, or at least my next level and take some notes from our friend Zachary in Bloomington, he runs a killer polo blog. Go over and check it out if you haven’t already, the URL is topshelfpolo.com. Really making me look bad there dude. So a lot had happened in the last year in the polo-verse, in the club, the state, and the whole picture. In the larger polo-verse this year’s competitive season has come and gone, that is a good place to start. For those of you that do not know the qualifying system for teams (of three people) that want to play in the Continental and World stages (Continental would be like North America, South America, or Europe) your team must play in your club’s region’s qualifier, then if you and your team make the cut-off to get to NAHBPC (North American Hardcourt Bike Polo Champeenships). 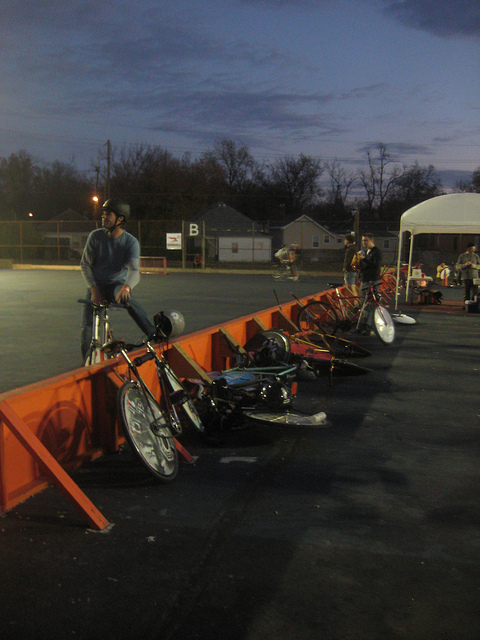 If you and your team play well at NAHPBC and make the cut-off to qualify for WHBPC (World Hardcourt Bike Polo Championships). With the growing popularity of the sport this past year’s qualifiers were very full, but I suppose that is a good problem to have. Here is Mitten Polo ready to play in Madison. With the intro out of the way I can now walk us through my 2012 tournament season. I played with my friends Jon and Piet, our team name is/was Mitten Polo. CONGRATS PIET! We are all so happy for you and Molly with the birth of Niels, you guys are going to be great parents and we look forward to your return to the club if and when you can find the time. Sorry, had to get that somewhere on this post. Mitten Polo played in the Mid-West Champeenships, and the ESPI’s (East Side Polo Invite) for our two qualifiers. We played poorly in the Mid-West’s and missed qualifying by literally two goals, we got hooped. Mid-West’s were held in Madison, Wisconsin this year. It was fun to visit there with Jon, his girlfriend Rebecca, and Piet even if we didn’t do as well as we had hoped. We went to some cool coffee houses, and stayed with our friend Gavin, he rocks. So with our defeat in hand we went back to the mitten and the drawing board for our last chance to qualify in Fredrick, Maryland at the ESPI’s. Fredrick is a cool town too, lots of old brick buildings downtown. There was a great BBQ place there, I’d go for some of that right now actually. The courts were big, and smooth. They were full sized hockey rinks with real boards. This is the first time I’ve played net against the east coast forwards, they are pretty damned good. We played much better there and just barley qualified for NAHPBC in Milwaukee, Wisconsin. In Milwaukee we played pretty well against a stacked field. Some of the games just felt like we were getting good looks at the net but the goals were just out of our grasp. But there is always next year, even if I will not be playing with the complete Mitten Polo or maybe even two new people. Only time will tell. So with Worlds in Geneva this year we all couldn’t afford that trip so NAHBPC was our big show and we have fun there and the road that go us there. I’ll come back soon and give an update on culture of polo developing in Grand Rapids, Michigan. Until then, keep the ribber side down everyone. Rubber side down. The long awaited mid-summer post, even if a little late. Greeting from the Mitten, summer has come and stayed for awhile but now summer seems to be bored and looks like its gonna move south soon. The nights are starting to cool down to those crisp evening nights that I think are so lovely. It also happens to be perfect polo weather. 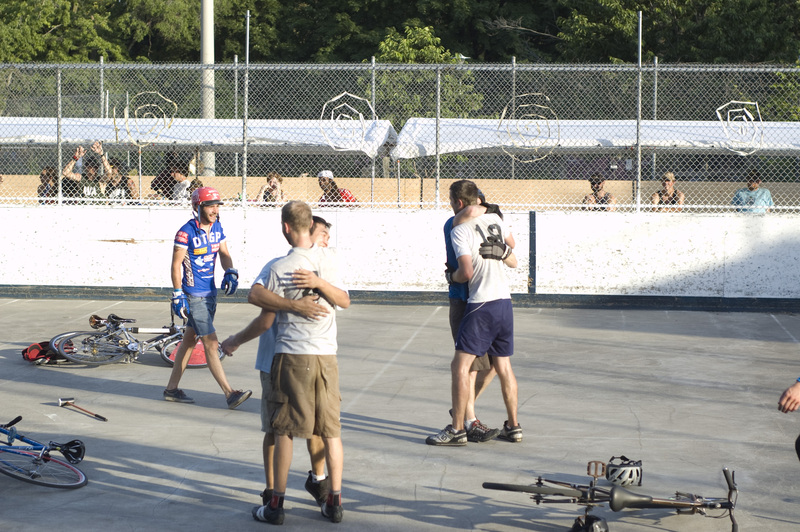 The club has had some great outings this summer, among the tournaments attended by at least one member of the club include the Midwests Qualifier in Bloomington, Cascidia Qualifier in Portland, Northside Qualifier in Toronto, The Circle Jerk in Columbus, and The North American Harcourt Bike Polo Championships in Calgary. The club continues to grow in skill mostly due to the players who do travel bringing back what they have learned from other player and other clubs. It was very intresting to watch all the west coast teams play in Calgary, they play with a diffrent style. 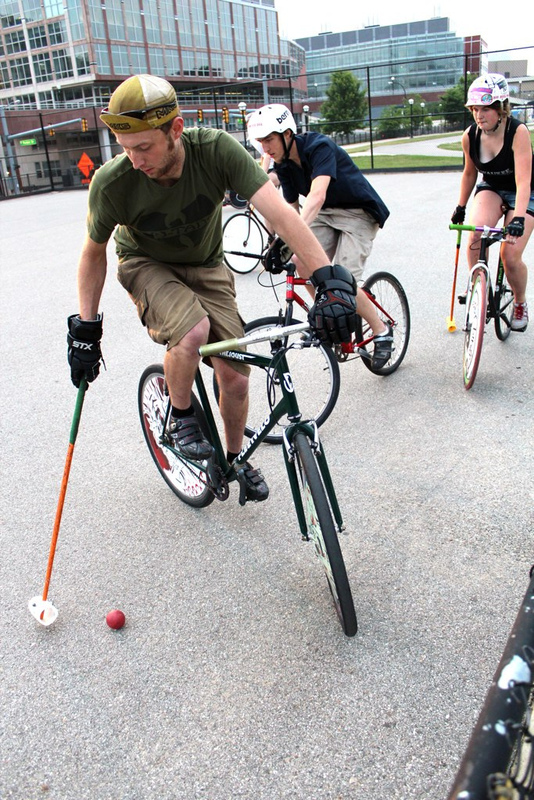 The club also plans on going to the Midwest Open in Milwaukee in October and we are sending our Mitten Polo team to The World Harcourt Bike Polo Championships in Seattle at in two weeks. Here is Rusty Nutz (a2) playing the ringer mixup team Sure Bud in Toronto deep in the double elimination brackets. Here is the same game, but you can see in this photo just how big the courts were in Toronto, HUGE. This is right after the final in Toronto, Ann Arbor was defeated by DTGP (Two guys from Toronto, one from Paris, FR) 4-3 in sudden-death overtime. Thanks for the awesome time Toronto! We are very excited that we qualified a team through the regional and continental levels to compete at the world level. In terms of numbers the club has had less players show up than last year at this time, but there are a few new players who show intrest enough to play more than once. So to whoever in Ann Arbor or Ypsi that is reading this, please come out and check us out if you have any intrest at all if you have not already. 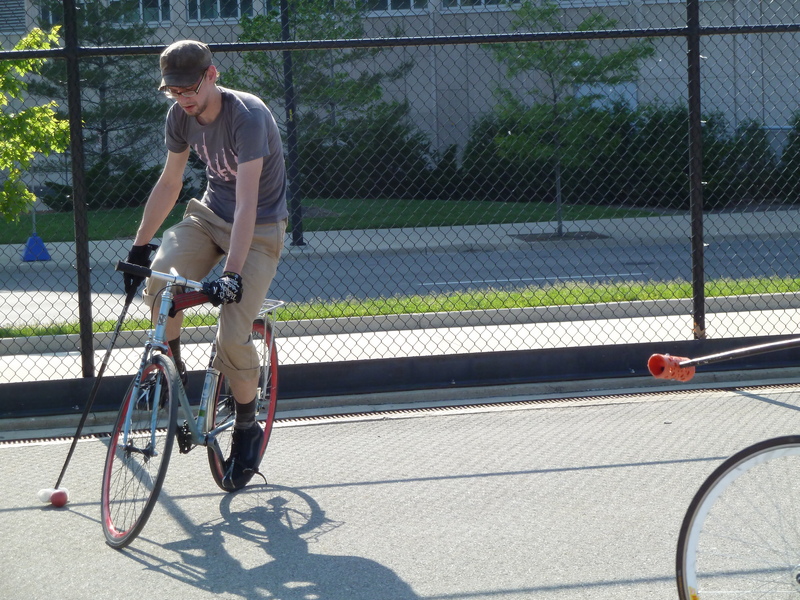 We have spare mallets to lend and really like to see new people coming out, even if just to watch. All of the club information can be found in the first post on this blog. Stop waiting! Come play polo! 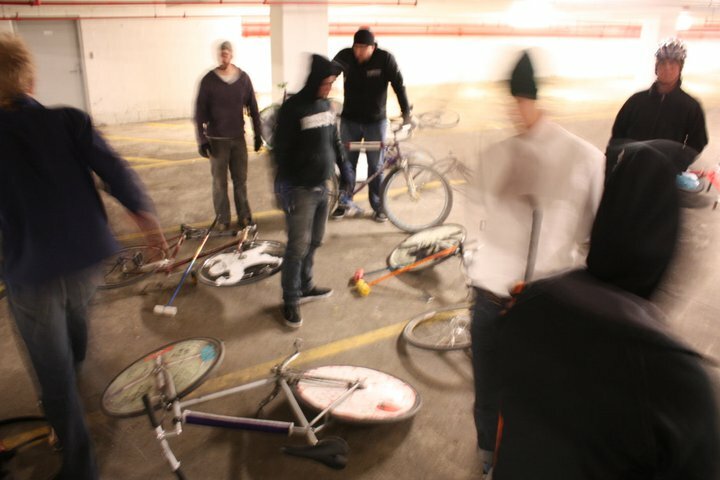 Here is a film of the Rusty Nutz Vs. HJWD in Toronto in the Knock-Out rounds, film by Uolmo. I will return with a entry expanding on the NAHBPC and WHBPC when we return from Seattle. With the current weather of about 40 degrees and rain it is a good day to stay in and drink coffee while thinking about how sweet it will be to play out side when all this frozen stuff is gone. I check on the court about everyday, at least every time I go practice in the Thunderdrome. I’m still compiling data for my mallet review, and I want to get it reviewed in the American Polo Journal before I post it up here. We are headed to Lexington next weekend for a weekend of polo fun, this is the first outing for our club this year. and it looks like it will be a grand ‘ole time. There will be a weekend of pick-up, meeting new friends on Lexington’s beautiful courts, and a 2v2 random draw tourney. 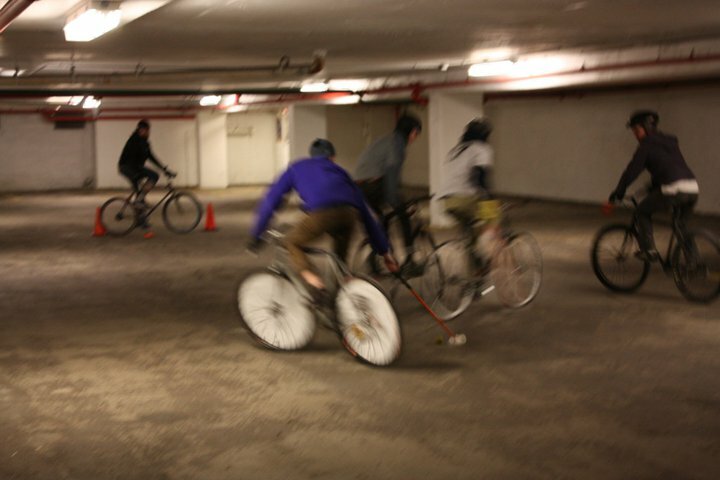 And I get to put my brand new FleetVelo Joust through its paces in a high level game there. In the initial testing and practicing on the new frame, I really really like the geometry. The nimbleness of handling at any speed is excellent. I feel so high up when riding that frame, after playing on a old Gary Fisher for the last month or so the Joust feels like a sports car versus a beat up truck with no suspension. I geared up for playing freewheeled, which I’ve been liking more and more, i will continue to play fixed but in the offensive zone FW lets you get to more shots. And I like scoring goals. It also helps that the bike looks really good, its painted British Racing Green. And if anyone wants to throw money at a hub set I recommend the White Industries I put on it. The polished oversize flanges looks really good next to the S & S couplers. 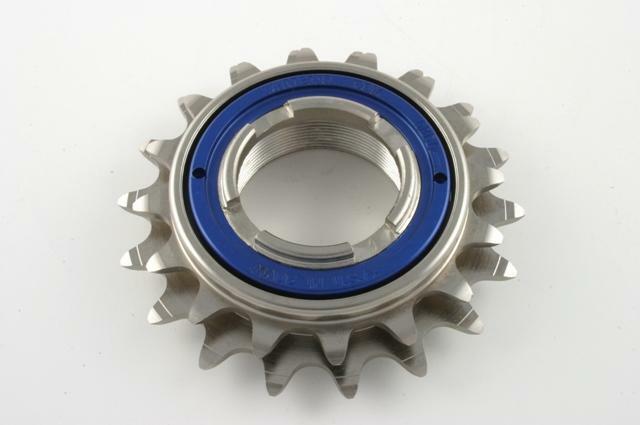 Mechanically the hubs which I bought sight unseen are flawless. The splined carrier for the cog eliminates the chance of stripping the cog’s threads but it does lock you into using WI cogs until the end of time. The WI DOS freewheel is perfect for the otherside, it allows you two different albeit close gear ratios, and it sounds so good. I took a picture of it but its on my phone and does not give the bike justice. I’ll post a high resolution shot once I have one. I’ll start this post with a brief look back on how polo got started here in Ann Arbor. I believe it was Big Matt and Jimmy Rigged that were organizing the first games that they played at Wheeler Park on the basketball court in the fall of 2007. I think Matt had made all of the mallets which were the heads off old Crockett mallets bolted to ski poles, very heavy. 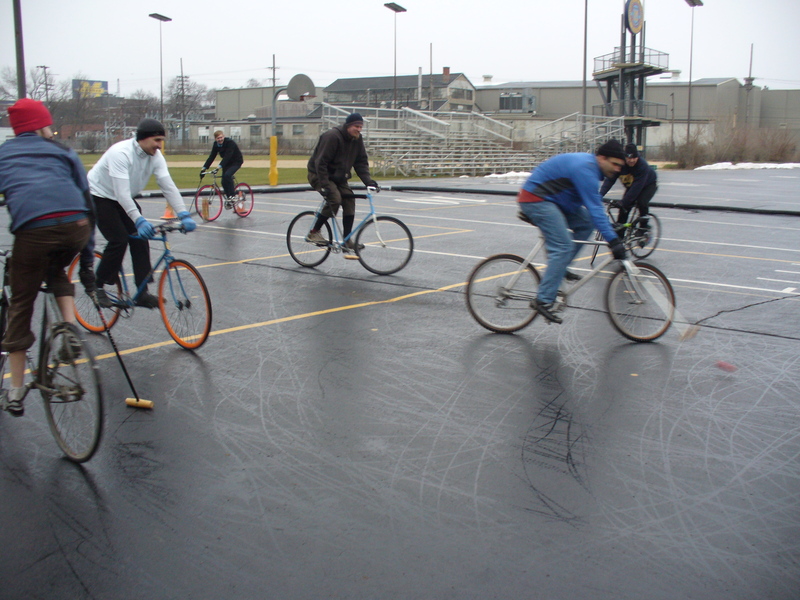 After the winter where we first played in the Thunderdrome we moved play to Elbel Field in favor of a wide open surface. The court at Wheeler was small and had larger pole for a basketball hoop in the middle of the court. Here is a shot of one of the first times we played at Elbel Field. 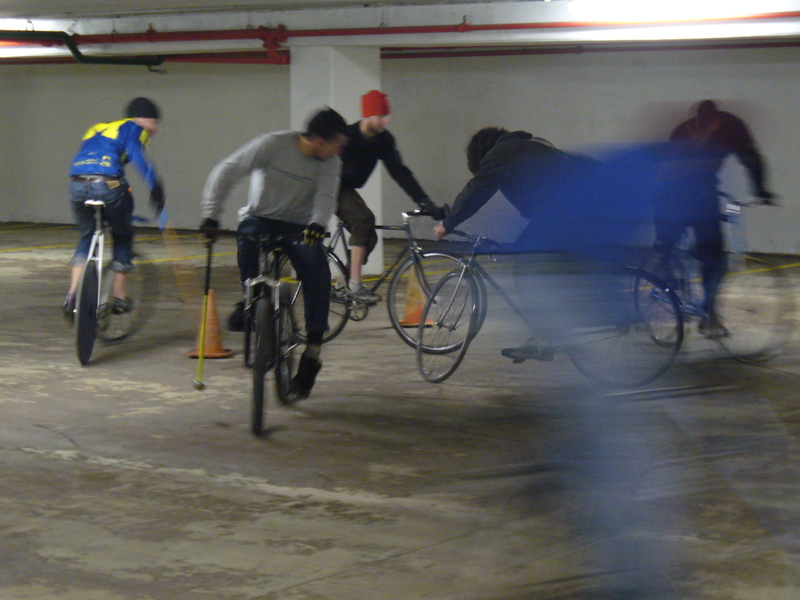 This is a shot of one of the first times we played in the Thunderdrome. We moved again to the site where we currently play, at Palmer Field. Through the two years of play we have seen friendly faces come and go, some move and some just lose interest. Thankfully we have had some younger people take up the sport and we are always trying to get more people out to play. Here is a shot of Nick who moved to Minneapolis this year, he has played with us since the beginning. This was taken at Palmer Field. And here is Brian who moved away for school in Utah, he’s looking all manly with no shirt. This year was a great year for the growth of polo in Michigan. Two clubs have solidified them selfs in the state, Grand Rapids and us. Both clubs visited other cities for tournaments which is key for the growth of a polo club. We have a healthy rivalry going with Grand Rapids, they got a legal organization status before us, great job guys we are hoping to join you, but we (Piet, Matt, and me) did beat them twice in a row in Minneapolis in an honor bout. I remember one guy who rode past that game yelled “What is this Michigan vs. Michigan! ?” This year we gained a very skilled player from Wisconsin named Jon, he is helping us all up our game. We plan on going to Lexington again this March which should be near as much fun as the first time, but that will be hard to top. So as much a I’m looking back on last year fondly I’m thinking this year could be better. I’ll be back with a mallet comparison when i’ve got it all done, we will be comparing material and shape. Take care Poloverse. Here is a cool photo sequence that Ben Lopez put together. 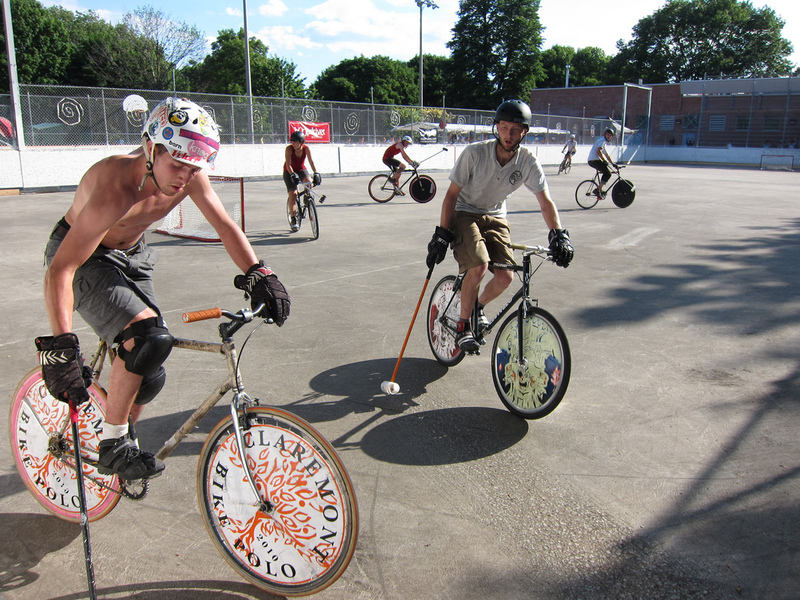 this is a blog reporting on and spreading information about hardcourt bike polo, in Ann Arbor, Michigan. We have been playing since late 2007. Last year was a good building year for a2Polo, we sent teams to the Midwest Championships in Minneapolis MN, North American Hardcourt Bike Polo Championships in Madison WI, and the Midwest Open in Lexington KY. We didn’t get near any podiums but we learned a lot from all the teams we played against. 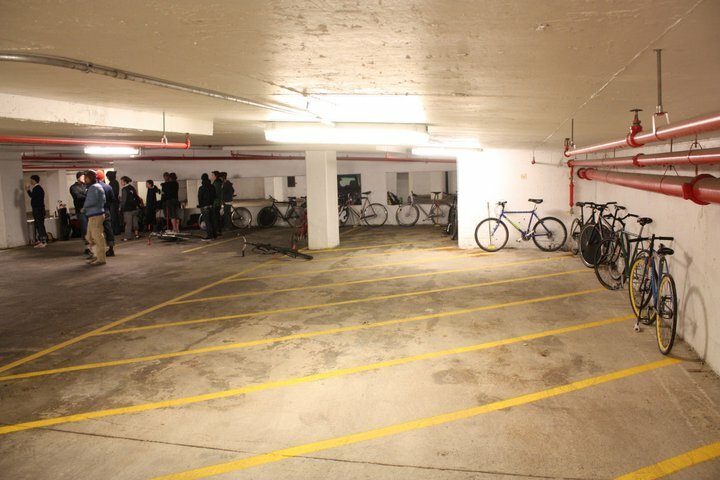 We are all itching to get out of our beloved/hated parking structure and play outside, with the snowfall today it looks like will keep waiting. We hosted the Grand Rapids and Fort Wayne clubs for some friendlies back in January. Here are some photos from that. Here is everyone on Saturday night. Photo courtesy of Robb Johnston. Another shot of all the clubs together. Photo courtesy of Robb Johnston. Here is Piet, 'lil Jim, some guys from Ft. Wayne, and myself in a game. Photo courtesy of Robb Johnston. people taking a break with my now broken bike in the foreground. Photo courtesy of Robb Johnston. Zachary on Its melting, excellent.